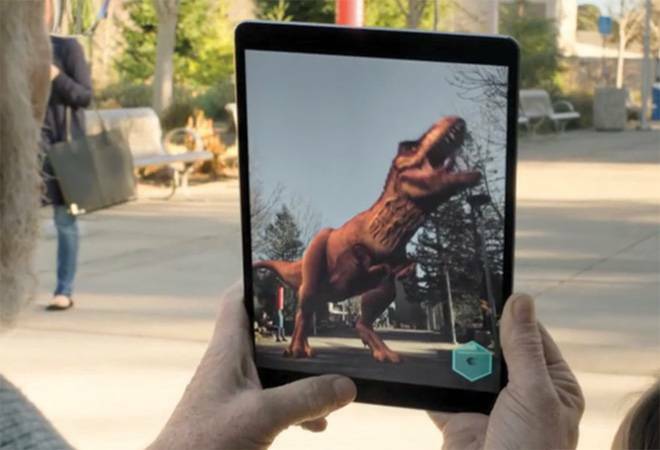 Augmented reality is set to take the tech world by storm in the wake of new announcements from Apple and Google. Helping the younger generation understand the effects of climate change and the importance of water bodies can be challenging, not to mention tedious. But what if a life-like 3D model could show how the smallest of human actions can impact the environment? WWF Free River, an augmented reality (AR) app does just that. When you point the iPad's camera on a flat surface, the app overlays a realistic 3D model on the screen offering a spectacular landscape view - showing rivers, rain and dams and how they affect habitation, and helps explore more sustainable ways for energy development. As is sufficiently evident, AR technology, by overlaying digital information on top of the real environment, can render a truly immersive experience across industries. Just pointing the camera on the subject can make things come alive. Take for instance the IKEA Place app that makes shopping for furniture easy. The app helps visualise what furniture would blend well with your home decor. The Human Anatomy app is another example that helps visualise and understand the intricacies of the nervous system in 3D. AR is not a new technology but has been overshadowed for long by virtual reality (VR) that finds significance in the gaming industry. VR technology disconnects you from the real world and involves the use of specialised headsets (priced as low as Rs 220 for a cardboard VR), whereas AR offers a more life-like experience and involves placing a computer-generated graphics in the real world environment. For developers, the lure of creating virtual content instead of placing it over the real environment was a big one. But Apple's CEO Tim Cook has been a big fan of AR. "AR has the ability to amplify human performance instead of isolating humans," said Apple's CEO Tim Cook during one of the company's earnings call. Apple's ARKit helped developers design apps for a seamless AR experience on iPhones and iPads. ARKit 2, the latest one, will be helpful in designing advanced AR apps that can track 3D objects and support improved face tracking. Google, too, has been working on this technology for quite some time. It has now replaced its Project Tango with ARCore, a platform to build AR experiences. It supports vertical plane detection, which means that instead of pointing at a flat surface, one can place AR objects on different surfaces, like a textured wall; and Augmented Images that can bring images to life by merely pointing the phone at a poster or see what's inside a box without opening it. Both ARKit 2 and ARCore are encouraging developers to build shared AR experiences - apps and games in which multiple users can participate and view the same virtual environment from a different angle. Be it the world of education, medicine, gaming, tourism or automobile, AR is finding takers everywhere. There are AR apps that can tell you the dimensions of a door or a box without you having to look for a measurement tape. In fact, Apple is launching a Measure app with iOS 12. The Froggipedia AR app for Apple, from an Indian developer, enables students to see and dissect a frog virtually; instead of the scalpel, the student uses the Apple Pencil. Art lovers can see and analyse the smallest details in an art piece using AR. The Boulevard AR app is a fine example of that. Although most of these apps can be used on smartphones, AR gadgets such as AR glasses and headgear are on the cards for special uses. In its paper An Augmented Reality Microscope for Real-time Automated Detection of Cancer, Google describes a prototype Augmented Reality Microscope (ARM) platform that could possibly help accelerate and democratise the adoption of deep learning tools for pathologists around the world. The platform consists of a modified light microscope that enables real-time image analysis and presentation of the results of machine learning algorithms directly into the field of view. A new market intelligence report by BIS Research states that the AR market is estimated to reach $198.17 billion by 2025, growing at a CAGR of 65.1 per cent. Mixed Reality, a mix of AR and VR, is also set to grow to $3.68 billion by 2025, at a CAGR of 72 per cent. Mixed Reality requires high-end glasses like Microsoft HoloLens and Meta 2 and has great uses in the manufacturing and medical industries. HoloLens is actually helping doctors achieve more accuracy, shorter surgery times and risk reduction.